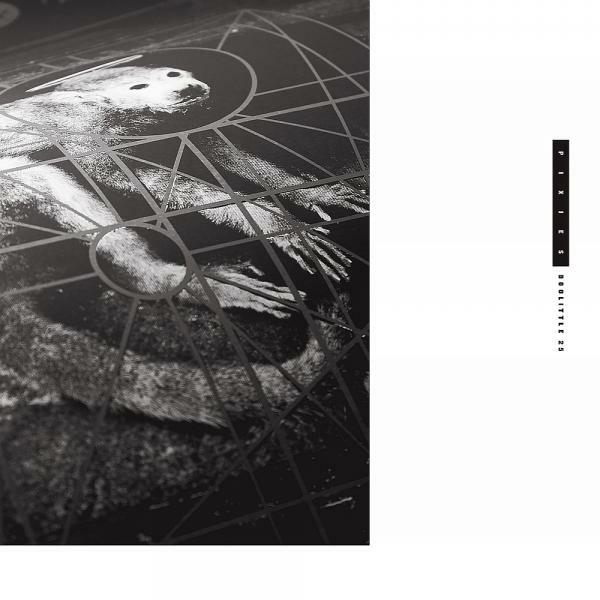 The Pixies will mark the 25th anniversary of their classic sophomore album Doolittle with an expanded 3CD, 50-track reissue this December that will feature, as bonus material, the record’s B-sides, two of the band’s Peel sessions in their entireties, and a full disc’s worth of demos — a collection that will include a total of 21 previously unreleased tracks. Due out Dec. 1/2 via 4AD, the Doolittle 25 reissue features the full album on the first CD, a second CD featuring the record’s six B-sides plus the seven songs recorded for John Peel’s BBC show during the band’s sessions on Oct. 18, 1988, and May 2, 1989 (two of which are previously unreleased), and a third CD with 22 Doolittle-era demos, 19 of which have never before been released. The bonus material also will be released digitally, as well as in a 2LP set that includes the B-sides, Peel sessions and some, but not all, of the demos (see tracklists below). The reissue also features a new sleeve that Vaughan Oliver reinterpreted from his original album artwork and Simon Larbalestier’s photographs, according to 4AD. The Doolittle 25 reissue can now be pre-ordered directly from the band (with a couple different T-shirt combos), as well as from 4AD, Amazon.com and Amazon.co.uk . Looks like a barn burner of a release for sure but I didn’t read anything from any of the links stating that it has been remastered, remixed or both. If not I’ll just save some money and download the demos separately, already have the b-sides. Seeing as how it’s the Pixies, we can assume safely that the emphasis is going to be on boosting the treble on the reissues. It wouldn’t a Pixies release if they didn’t (wait for it . . . ) get rid of the bass. True, very true. I was worried because that $500 box set they released a few years ago was such a scam. I never understood that one. I would like to know if the original record is being remastered too.